1 What are Fluid Inclusions? Fluid inclusions are microscopic traces of past or present-day subsurface fluids that become entrapped in rocks during formation of diagenetic cements or healed microfractures. These fluids are generally faithful recorders of pore fluid chemistry and are not subject to evaporation during sample storage, or loss of light ends during sampling from depth. They persist in the geologic record long after the parent fluids have moved on, but are continuously formed even up to the very recent past. Fluid inclusions can be detected, characterized and quantified to variable degrees with sophisticated instrumentation such as mass spectrometers, or by preparing thin sections of rock material and viewing them under a microscope equipped with a controllable temperature stage. Specific tests can be done on these inclusions in order to study processes occurring within the earth, in particular, processes involving migration and accumulation of oil and gas. 2 What is Fluid Inclusion Stratigraphy? Fluid Inclusion Stratigraphy (FIS) is a patented Amoco technology, licensed to FIT Inc., which provides a means of analyzing organic and inorganic fluid species within fluid inclusions trapped in cuttings, core or outcrop samples. The newly available technology delivers a unique view of petroleum and diagenetic processes operating from basin to reservoir scale. Our automated analytical system employs a novel, quadrupole mass spectrometer configuration that allows rapid chemical characterization of inclusion volatiles. This information is used to predict the distribution of oil and gas within the subsurface, to characterize specific aspects of undiscovered petroleum that affect the economics of producing the petroleum, and to provide information on when (if at all) petroleum may have moved through a given portion of the subsurface. Large sample sets from single or multiple wells can be evaluated, allowing analysis of fluid inclusions in both archived samples (cuttings or core), and currently drilling wells to play a key and cost-effective role in evaluation of exploration acreage and focusing of exploration efforts into the most prospective areas. These technologies are applicable to virtually every geological environment, lithology, and petroleum type; FIT's interpretive expertise is based on experience analyzing over 750,000 samples from more than 2500 wells encompassing every major petroleum-producing environment. Over the last 8 years FIS has found significant petroleum reserves, influenced exploration and acreage acquisition decisions and provided innovative options for resource estimations, petroleum production and enhanced oil recovery operations. Figure 1: Comparison of FIS data from condensate and non-prospective areas. Two specific examples serve to illustrate the application of FIS. 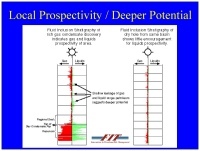 Figure 1 documents FIS gas and liquids indicators within two wells, a rich gas condensate discovery and a dry hole from the same basin. The top of the productive reservoir is clearly identified as an abrupt increase in gas and liquid range species within fluid inclusions. Furthermore, liquids prospectivity of the area is anticipated by shallow petroleum fluid inclusion "shows" which suggest leakage or migration of a similar product past the regional seal to production. In contrast, the dry hole shows minimal hydrocarbon indications, which are much drier, and suggest limited potential in this portion of the basin. Drilling in this area to date has supported these FIS predictions. Figure 2 illustrates FIS gas and liquids responses from a dry hole in a gas province, which was drilled downdip to a subsequently drilled oil discovery. 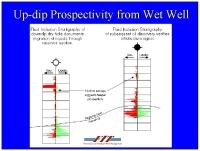 FIS data from the dry hole indicate migration of oil through the reservoir section, and fluid inclusion microthermometry indicates that the entrapped petroleum phase is oil with physical characteristics (e.g., API gravity) closely matching that of the reservoired oil. FIS and other fluid inclusion data from the discovery well verify the offstructure signal. Shallow leakage or migration of petroleum in both wells suggests deeper prospectivity for gas and liquids in the area. Figure 2: Comparison of FIS data from downdip dry hole and subsequent oil discovery.